Last Thursday I caught up with bike commuter Glenn Hinrichsen at Lake Sammamish Parkway near Marymoor Park. It was not even 7 in the morning and he had already covered more than two thirds of his 16-mile commute from Kenmore to Bellevue. I was hardly awake. 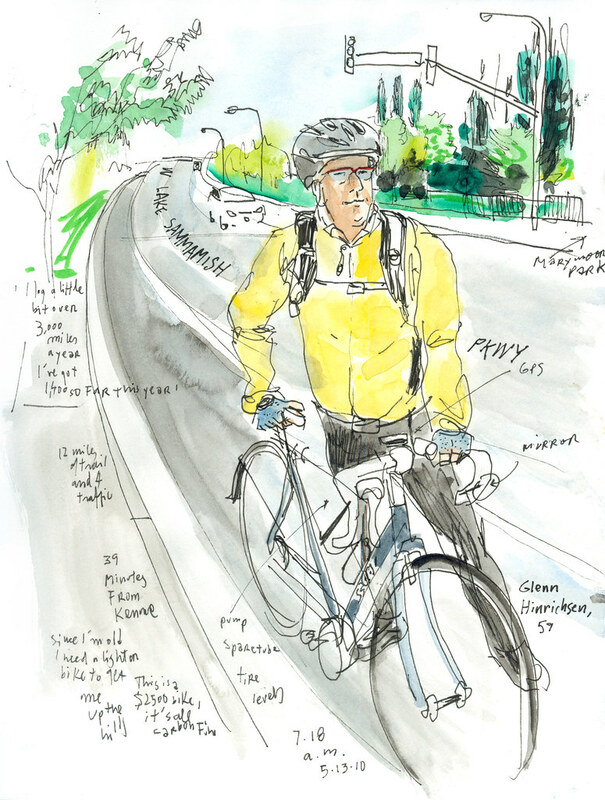 Hinrichsen, 59, started biking to work 8 years ago and now bikes pretty much everywhere. “I log a little bit over 3,000 miles a year. I’ve got 1,400 so far this year,” he said. A year after he took up cycling, Hinrichsen found out he had two blocked arteries in his heart during a routine medical checkup. “I had really high cholesterol,” he said. He had a stent put in his heart but a week later he was on the bike again, riding the Daffodil Classic, a cycling event in Pierce County. “It was only a 20 mile loop,” he said.